I’ve used restorative circles in my elementary classroom since the beginning of the school year and I can already feel the sense of community developing quicker than in previous years. My school counsellor introduced my to the idea of restorative circles by handing me the book, “Restorative Circles In School.” The International Institutes for Restorative Practices produces the book and they have a great website full of useful information. Although circles in my classroom are in their infancy I appreciate the opportunity to sit with my students and listen to their stories, their thoughts, and really understand whether or not they’re reading for take in new learning. In my grade 5/6 classroom circles take place, twice a week, on Monday mornings and Friday afternoons. We meet on Monday’s so that we can check-in after the two day weekend break. If some of my student’s have experienced a difficult weekend I have the opportunity to give them additional supports before. The circle is formed so that everyone can see each other and no one is hidden from sight. Already, I feel a deeper connection with my students after only a few weeks of the new school year and I feel the class has been exposed to a new type of support network. Some students may offer their support to other students who might need help. Other students may ask for help or support from another student for the day in an effort to lessen the burden they may be facing. The most important consideration I’ve noticed so far is making sure a level of trust has been established in the circle. This helps affirm to students that it is safe to share information and express oneself. 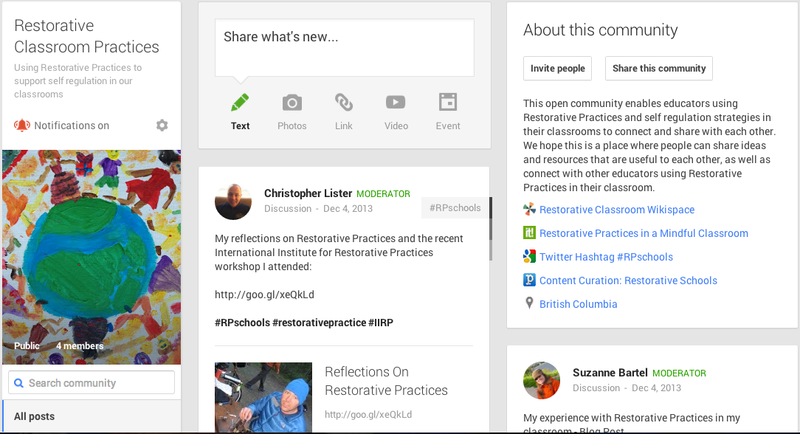 I would welcome connecting with other educators who are conducting restorative practices in their classrooms.